February 26, 2018 – In the 1980s, researchers began discovering extremely bright sources of X-rays in the outer portions of galaxies, away from the supermassive black holes that dominate their centers. At first, researchers thought these cosmic objects, called ultraluminous X-ray sources, or ULXs, were hefty black holes with more than ten times the mass of the sun. But observations beginning in 2014 from NASA’s NuSTAR and other space telescopes are showing that some ULXs, which glow with X-ray light equal in energy to millions of suns, are actually neutron stars — the burnt-out cores of massive stars that exploded. Three such ULXs have been identified as neutron stars so far. Now, a Caltech-led team using data from NASA’s Chandra X-ray Observatory has identified a fourth ULX as being a neutron star — and found new clues about how these objects can shine so brightly. Neutron stars are extremely dense objects — a teaspoon would weigh about a billion tons, or as much as a mountain. Their gravity pulls surrounding material from companion stars onto them, and as this material is tugged on, it heats up and glows with X-rays. But as the neutron stars “feed” on the matter, there comes a time when the resulting X-ray light pushes the matter away. Astronomers call this point — when the objects cannot accumulate matter any faster and give off any more X-rays — the Eddington limit. In the new study, the researchers looked at a ULX in the Whirlpool galaxy, also known as M51, which lies about 28 million light-years away. They analyzed archival X-ray data taken by Chandra and discovered an unusual dip in the ULX’s light spectrum. After ruling out all other possibilities, they figured out that the dip was from a phenomenon called cyclotron resonance scattering, which occurs when charged particles — either positively charged protons or negatively charged electrons — circle around in a magnetic field. 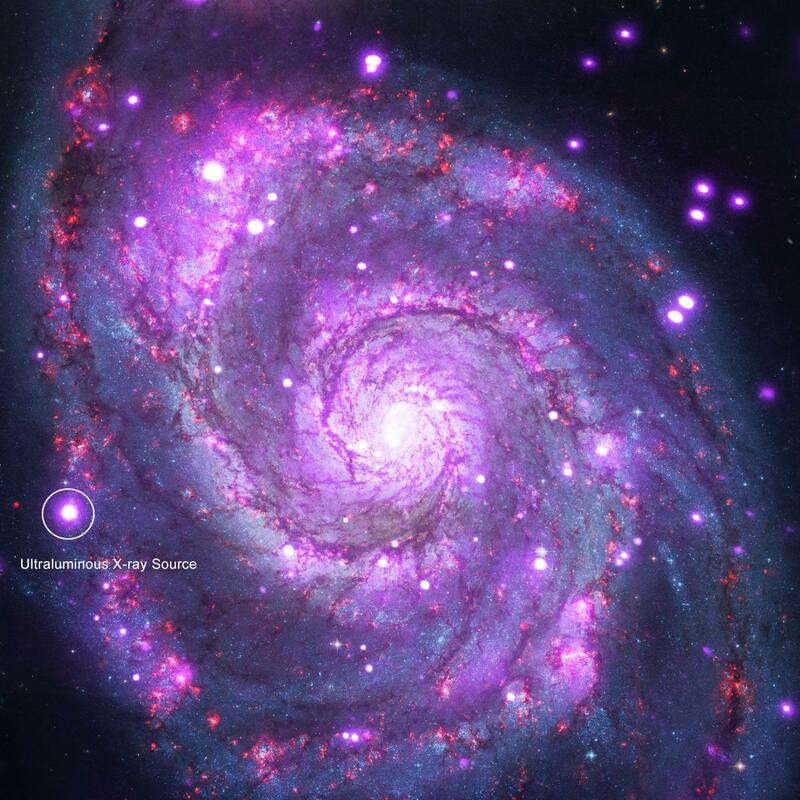 Black holes don’t have magnetic fields and neutron stars do, so the finding revealed that this particular ULX in M51 had to be a neutron star. Cyclotron resonance scattering creates telltale signatures in a star’s spectrum of light and the presence of these patterns, called cyclotron lines, can provide information about the strength of the star’s magnetic field–but only if the cause of the lines, whether it be protons or electrons, is known. The researchers don’t have a detailed enough spectrum of the new ULX to say for certain. “If the cyclotron line is from protons, then we know that these magnetic fields around the neutron star are extremely strong and may in fact be helping to breaking the Eddington limit,” says Brightman. Such strong magnetic fields could reduce the pressure from a ULX’s X-rays — the pressure that normally pushes away matter — allowing the neutron star to consume more matter than what is typical and shine with the extremely bright X-rays.